A photograph is essentially a strictly defined a view of the world, whose edges exclude everything else. These borders and corners can be so much more than simply 'the beginning of the end' of our image, they can have a critical role as a component part of the whole composition. Elements placed onto the corners or edges can add dynamism and flow helping to underpin the overall structure of a composition. Images appear much stronger when there’s a relationship between the corners and what’s inside the frame, and where possible, I like to place diagonals on the corners. This generates more inclined lines running toward the image’s centre. These can help to draw the eye into or out of the frame, providing subtle visual cues as to the ‘entrance’ and / or ‘exit’ of the overall frame, complimenting or enhancing ‘main’ visual guides like lead in lines or S-curves where they exist. Typically the elements used within the landscape tend to be very subtle; the curve of cloud formations, the form of a boulder, the branch of a tree. And so as these are not obvious 'big' landscape elements (like a mountain) can go largely unnoticed to the viewer, but I think these work on a more subconscious level to influence the eye’s flow. Conversely, where we’d prefer to prevent the eye wandering away from the body of our photograph, we should keep the frame edges completely clear of stray, unwanted scenery. 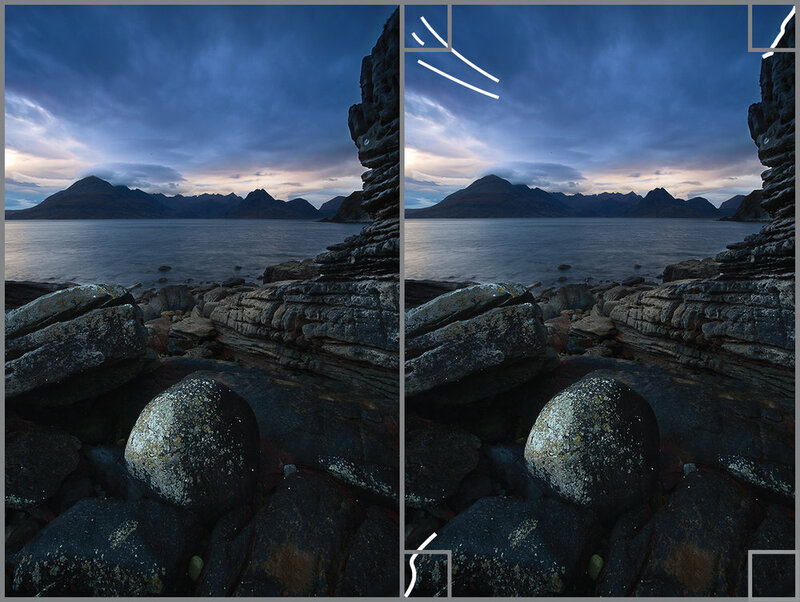 Typically minor visual intrusions (say twigs, kelp, flotsam, the odd boulder) that cut across the frame’s border can either break flow or cause the eye to follow them out of the frame. The absolutely last thing I do before firing the shutter is to consciously run my eye clockwise then counter-clockwise around the frame's edge in the viewfinder to make sure it is 100% clean. A visual sanity check to make sure that I have a 'safe area' around the borders, free from any random scenery sticking into shot. Regularly surveying of the edges will also highlight any extra details we might have missed when concentrating on our main subject, allowing us to review if there’s any surplus detail to further trim away to simplify our composition. On their own the frame’s edges won’t make a composition, they are what I would call an underpinning element. Remaining less visually obvious, all this attention to our corners and edges may go unnoticed by the end viewer, but all act to tighten and lift the composition. Whilst they won’t make an image, they can certainly break one.